A veritable hidden treasure, the Acura RLX is among the most technologically advanced luxury sedans. Three electric motors, one in front and two in the rear, take care of the all-wheel drivetrain, while the 3.5-litre V6 concentrates on moving the car with its 310 horsepower and 273 lb.-ft. of torque. Thanks to this gas-electricity combo, performance is good and fuel consumption is reasonable. Acura is promising a combined city/highway average of 8.1 L/100 km. 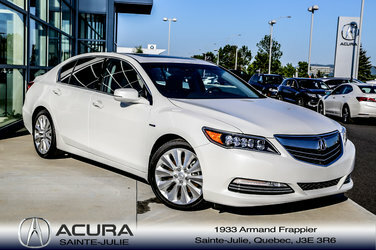 Want to try the 2016 Acura RLX V6 3.5L SPORT HYBRID TECH AWD BRAND NEW?